Your post really choked me up. 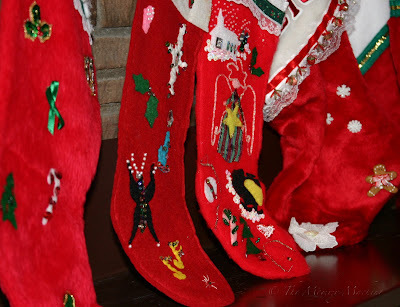 What amazing stockings - they are so personal and made with love. We always got an orange and a banana, but I would personally love to get a can of smoked oysters in my stocking - yummo. What your husband did for your little twin girls while they were on their way was beautiful - that is a loving twindada. What a beautiful tradition!!! 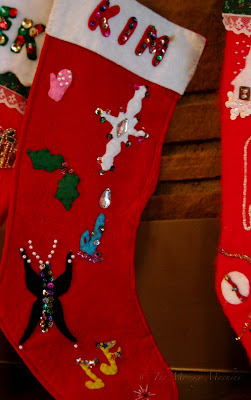 I'm sure your girls will treasure those stockings well into their adulthood!! And what your husband did in honor of your twins before they were born..that just melted my heart!! I'm dying to know the significance of the smoked oysters!! Love your stockings for Christmas.... specially the designer perfume. No WAY! We always had an orange and smoked oysters too!!!!!! Thats so wild. I also have continued the tradition. We always had smoked oysters for breakfast, along with egg nog. But not at the same time. Hee hee. Beautiful stockings, and I love what your husband did when you learned of your future blessings to come. He's a keeper, huh? G - I've always wondered if the oranges and oysters were a Finnish tradition, because of my mom's side of the family. But maybe they're an Alaskan thing? Hmm . . .